The Yard Stick One dongle (Yet Another Radio Dongle) can transmit and receive half-duplex digital radio signals on frequencies of 300-348 MHz, 391-464 MHz and 782-928 MHz, in modulations: ASK, OOK, GFSK, 2-FSK, 4-FSK and MSK. The YardStick One dongle uses the same radio circuit that popular IM-Me console with the ability to modify the firmware to create your own radio applications. The USB Stick Yard One comes with the RFCat firmware installed to control the transceiver from a Python shell or your own program + CC Bootloader installed. 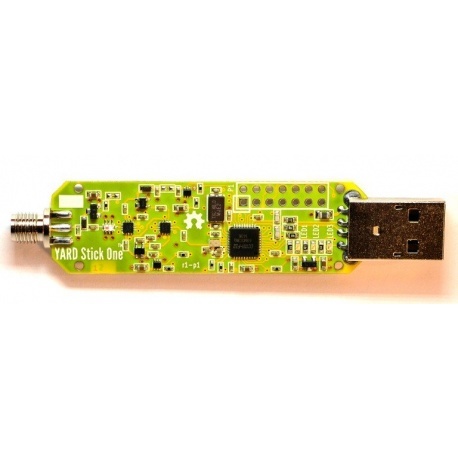 Description: The Yard Stick One dongle (Yet Another Radio Dongle) can transmit and receive half-duplex digital radio signals on frequencies of 300-348 MHz, 391-464 MHz and 782-928 MHz, in modulations: ASK, OOK, GFSK, 2-FSK, 4-FSK and MSK. The YardStick One dongle uses the same radio circuit that popular IM-Me console with the ability to modify the firmware to create your own radio applications. The USB Stick Yard One comes with the RFCat firmware installed to control the transceiver from a Python shell or your own program + CC Bootloader installed. Delivered without antenna (optional).